On Thursday, I decided to take a few photos of Eisley that would hopefully work out for our Christmas cards. 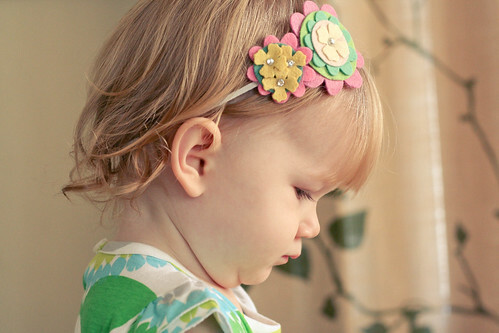 I had put on her new headband (from My Little Dear!) and she was distracted enough while standing up on the dining room chairs to not take it off right away. Victory is mine! Well, mostly. I have some fake berries in a few lotus bowls on the table and she is legitimately obsessed with those things. When all else fails throughout the day, I'll just let her stand there and scatter them throughout the general area. Clearly, I have learned to pick my battles. I ended up getting a handful of fantastic photos, which wasn't too shabby for a spur of the moment afternoon photo shoot. I'm not posting the best ones (the ones in which she is actually smiling and making eye contact—I swear, they exist! ), but I thought I'd show a couple of my favorite serious-toddler shots. Can I just mention how much I adore her profile? And those tiny ringlets behind her ears? I die. I was secretly hoping to have a nice handful of out-takes (like last year's shenanigans) but this year I didn't get any truly ridiculous expressions from her. The only thing I must admit is that in order to get her to bust out a genuine grin for the camera is to say "Jesus" very loudly and very awkwardly. It's borderline sacrilege, but desperate times (getting a good photo for Christmas cards) call for desperate measures (making my neighbors think I am clinically insane). I'm not sure why she finds it entertaining, but it's my no-fail technique. Aww, her little face is so cute! I love kids at the toddler stage. And love her headband! I don't wish I were a kid, but sometimes lttle girls have such cute things to wear like that! Glad you were able to take some great photos of her for Christmas! And hey, whatever works to get the picture is worth it! I literally gasped when I saw them. She is so beautiful. ohh, so she looks so sweet!!! If they only knew how adorable they look with hair accessories, maybe they wouldn't take them off!!! 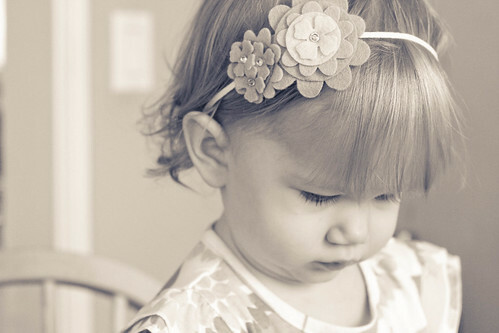 eee her ringlets are so precious & love that little headband. she is such a little lady. getting a pic of kids is stressful. the end. Also, is it bad that I want one of those headbands for myself? The cards came out GREAT! :)! That darling face is on our fridge. She looks so much like you! I adore those curls, too!